Earn CE credits while developing new skills. Everyone plays an important and specific role in the transformation journey of an organization. These roles are centered around aligning the work to the organizational goals, enabling others to solve problems, and improving processes and outcomes. **Continuing Education credits are available for some workshops, please see descriptions for details. Catalysis Healthcare Value Network member, Cleveland Clinic, has been on an improvement journey since 2006. In 2013, the organization began to shift their vision to create a culture in which every caregiver is capable, empowered and expected to make improvements every day. Their journey of learning has shifted to a model that is proactive, where accelerated improvements are the result of caregivers feeling empowered and capable to look at problems differently. 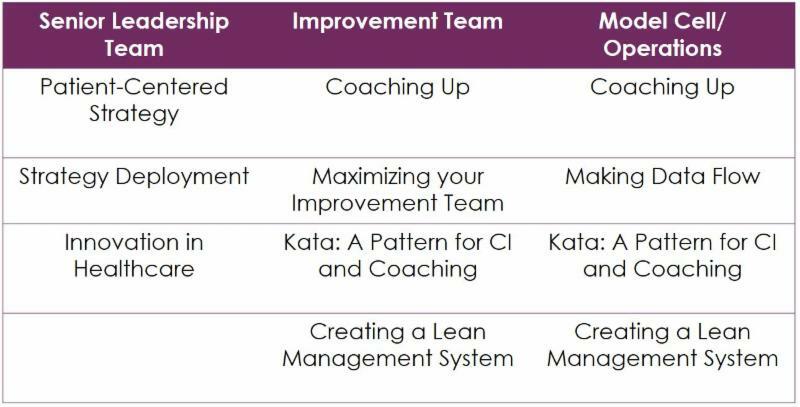 The Cleveland Clinic Improvement Model was developed to enable the organization to harness the power of everyone to understand their purpose and achieve their goals. The model, comprised of four systems, places focus on organizational alignment, visual management, problem solving, and standardization. The model further outlines the tools that are utilized with each system as well as the specific roles and behaviors expected of senior leaders, managers, and teams of caregivers. Don’t forget to register for the upcoming webinar with Steve Shortell and Tom Rundall of CLEAR on Sept 17th.